To realise that we need to help each other. Ask the child to see how much they can hold. Ask them to put out ther hands and say you will be putting things on their hands, but if they need any help, they must say. Bring out a bag of sugar. Say this bag of sugar represents some responsibility such as doing their homework and put it on their hands. Bring out a box of icing sugar. Add this to their hands and say this represents a chore that you have been asked to do this week, which is clearing up the breakfast pots. When they say they need some help, ask for a volunteer who can put their hands underneath the first child’s hands. Then add another weight. See if you can get a few children to help. Then take the bags away. Ask the children about the experience and how the first child how it felt when you got help. What does it mean to share your burden’s? Hand out the bible card. Some people think that to live the Christian life, you need to be strong like Sir Lancelot or Maid Marrian. You need to put on your armour, fight the good fight and win the day in the strength of God. But this view overlooks the fact that we need each other. The church is described as body with different parts. Each part has a part to play and each one needs to do their part for the church to function properly. Let a child read Galatians 6 v 1-10. – Don’t get tired about doing good things. – You will get a reward for keeping going. – Do good when you have the opportunity. See if they can give examples of when they can do these things. We are like chords and together we are stronger. Teach the children how to plait. 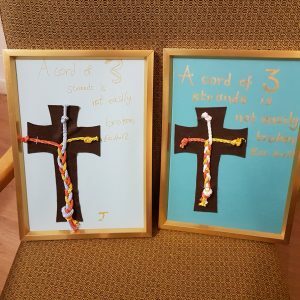 In pairs, make a cross by plaiting 3 chords. You will need a strong stapler, a cross cut out, a background piece of card and a frame.